Though he may have passed away in 1977, the King of Rock n' Roll's spirit has lived on through street corner impersonations and stage performances in shows like Legends in Concert. Throughout his extensive career, Elvis Presley's name grew to be a staple amongst casinos along the Las Vegas strip, and the City of Lights became his home away from home. 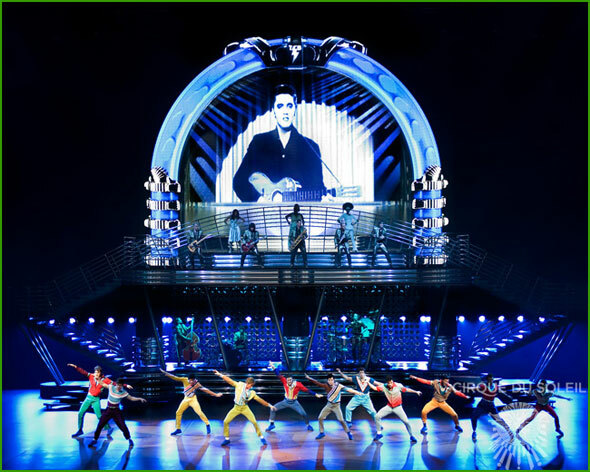 To help in memorializing the King, the crew that brought you the acrobatic mega-hits Ka, Zumanity, and Mystere has worked to put Elvis Presley back on Sin City's main stage. After agreements between Elvis Presley Enterprise and CKX Inc (who has 85% of the rights to Elvis' image and likeness) were finalized, the Cirque De Soleil crew began work on what would be their seventh resident show on the strip. Viva ELVIS started its run on February 19th, 2010 (pushed back from its initial January start date on Presley's 75th birthday) under the artistic guide of Guy Laliberte and Gilles Ste-Croix, and the direction of Vincent Paterson. The elaborate production for Viva ELVIS included the creation of over 400 costumes, a stage that would allow acrobats to walk upside down and ingenious items like a 70 foot Jukebox and 29-foot long blue suede shoe. The show premiered, and has continued its long run, at MGM's Aria Resort and Casino in City Center. Viva showcases significant points in the musician's life through a mix of acrobatics, live music, and intricate dance routines set to the soundtrack of Elvis' career. The audience is treated to a visionary representation of the King's life, including his stint in the army, overlaid with twenty one of his hit singles such as "Blue Suede Shoes", "Hound Dog", and "Can't Help Falling in Love". Unlike many of Presley's other stage incarnations, the King's voice, rather than that of an impersonator, rings throughout the large theatre adding to the authenticity of the show. 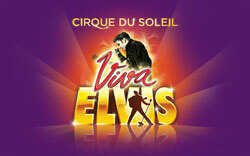 Viva Elvis show tickets availablity. With over 3,000 hours put into perfecting just the musical aspect of the show, it's no wonder that reviews have praised Viva ELVIS' use of the musician's hits. Of the few complaints that rang out amongst the audience, the most common was that the show did not hold true to the usual Cirque De Soleil performances. While there are acrobatics a-plenty, the show focuses more on showcasing ensemble dance routines like the re-imagining of the famous dance scene from "Jailhouse Rock". Though Elvis' life may have been strewn with controversy, Viva ELVIS forgoes such moments for the chance to offer a family friendly experience. While some Cirque De Soleil shows may borderline being too profound or simply inappropriate for anyone under the age of 18, the flair of Presley's music will help hold the attention of all theater-goers, big and small. Watched the Viva Elvis Show in Las Vegas ? Please share your experience with others.